Even before the last round of the league, everything important had been decided on the domestic soccer scene. Pilsen won the championship. Nobody could threaten Sparta in second place or Jablonec in third and prevent them from entering the third, or second preliminary round of the European League respectively. As winners of the Ondrášovka Cup, Mladá Boleslav also secured entry into the third preliminary round of the European League. At the lower end of the table, the second-last placed Brno and the last placed Ústí were leaving the competition. And it was a duel with Ústí where Boleslav tried to improve its final standing in the Gambrinus League table by one position. 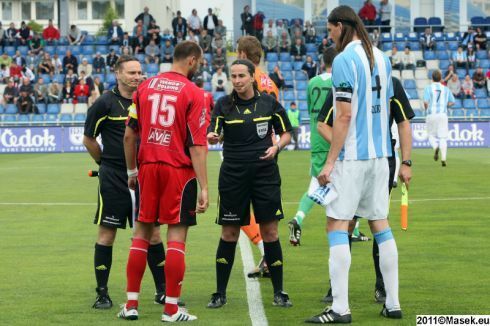 It needed to win, and the fourth placed Olomouc had to lose its match against the champion Pilsen. The first half did not offer any goals, despite several shooting opportunities for Boleslav and the spectators cheering some offensive breaks by the team. After some good interplay with Chramosta in the 2nd minute, Řezníček appeared alone before Novák, but could only hit the goalie. About half an hour later Chramosta missed two chances, the first after a pass from Řezníček, and the second after a centered ball from Táborsky. In the last minute before half-time Dvořák fouled Mendy to prevent him from shooting, and Šírl sent the resulting free kick past the right upright. Ústí came close to success in the 27th minute when Holek's nice header was cleared off the line by Táborský from next to the right post as Miller stretched in vain, and again three minutes before the break, when a grass-cutting cannonball from Dvořák was blocked by Miller before Rolko swept the ball away for a corner in front of the persistent Ústí forwards. At the beginning of the second half Boleslav did not display their passing accuracy from the first act.Vrtělka of Ústí came close to scoring in the 56th minute. Miller made a fantastic save when he stopped his header from close distance. Only after fifteen minutes did Boleslav return to their hand-clapping game. And finally they were rewarded with successful shots. After Procházka's pass along the left side line in the 67th minute, Kulič shot hard and made it impossible for the opponent's goalie to do anything - 1:0. Řezníček ran away in the 74th minute, pursued by a defender, then stopped on the spot and, instead of the expected shot, passed to an uncovered Mendy, who fired into an empty goal - 2:0. There were no more goals. Boleslav said a nice goodbye to its fans with this win, and confirmed fifth place in Gambrinus League 2010/11. Lineup of FK Ústí nad Labem: Novák - Hyčka, Valenta (85. Zacvhariáš), Polák (46. Džuban), Dvořák - Stožický, Lamešič, Vrtělka - Holek (60. Volek), Jindráček, Krbeček.